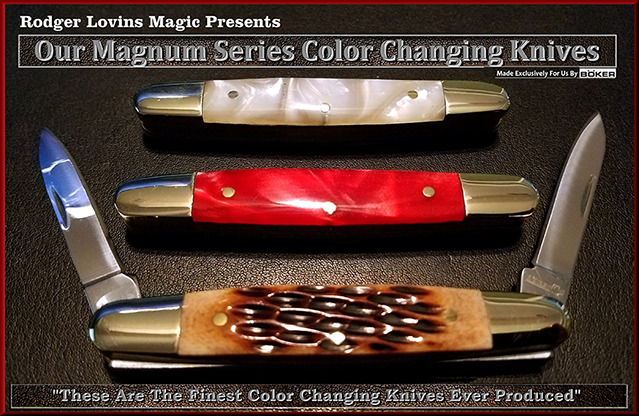 These pearl white and brown jigged bone magicians' knives are possibly the finest set of color changing knives ever produced. They were custom designed for magicians and the quality is built to last. Two years of working on this new design and with the help and expertise of The Boker Knife Company, Rodger Lovins Magic Presents feels they have built their finest knives to date. Each knife has two identical "highly polished" stainless steel blades. They are fitted with real nickel silver bolsters, and solid brass liners and pins. All three knives have Rodger Lovins Magic Presents' "trade marked" deep etched thumb pulls located on each side of the blades for an extra added subtlety. The slightly rounded shape makes the "paddle move" easy to perform and very deceptive. The size is 3 inches long, by 1/2- inch-wide, so they don't take up too much valuable pocket space. Having the deep jigging into the bone handle makes it very easy to tell one side from the other while in your pocket. These are not cheap dollar store knives. The machine work is precise in every detail and the handles are absolutely beautiful! The matching pearl white ungimmicked knife is also included in the set. As an extra added bonus, a second gimmicked pearl white and bright pearl red knife is included for those of you who do a three-knife routine and want a second color change. You get all three knives for one great price. Please make sure to order yours today before they all vanish! Please Note - These are professional magicians' knives; no instructions are included. These are really good knives, great quality! Altough they take up a whole pocket and maybe two if you are a card guy. Thats a lot for what they can do. If pocket space is dear to you I would think again because it's quite pricy, maybe not for the product but in magic value.